" Brotherhood of Railway and Steamship Clerks - June 30, 1923 - Traveling Card - Fitzgerald Lodge # 853"
(690) Brotherhood of Railway and Steamship Clerks - June 30, 1922 - Traveling Card - Condition:Good + This card has some darkening with age along right side. It is in a hard plastic card protector. The card measures 4" by 2 1/2". It was issued to George D. Mayo. 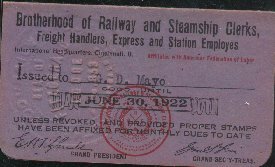 It was issued to members of the Brotherhood of Railway and Steamship Clerks, Freight Handlers, Express and Station Employees. The back of the card states that it is a traveling card for the Fitzgerald Lodge # 853. The card is signed by the President and Secretary of the Lodge. It is stamped with a seal. Price: $On Auction + shipping.